An unforgettable summer wedding held at the beautiful Casa Real Winery, located in Plesanton, California. 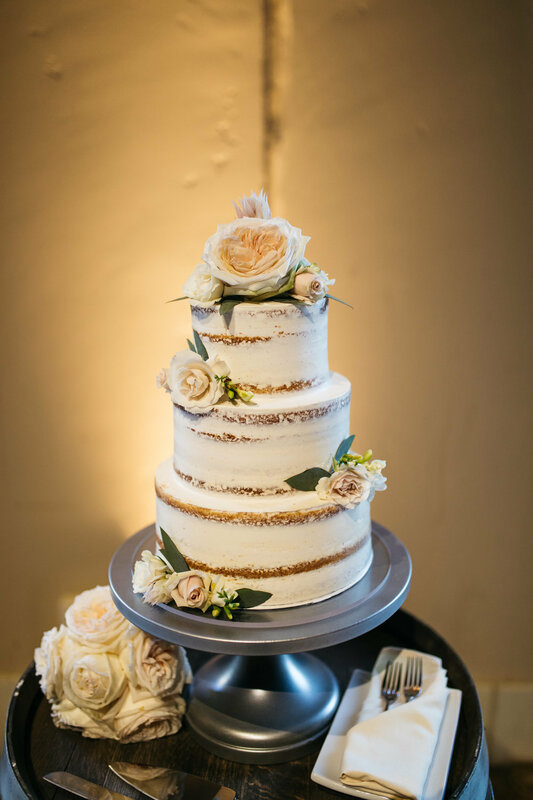 This wedding was cohesive and beautiful in every last detail! 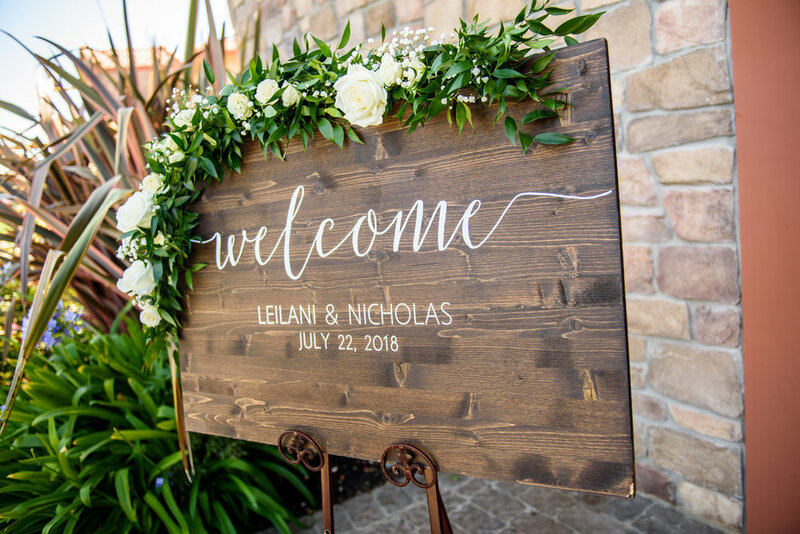 The welcome sign was topped with a fresh garland with tucked in white roses and hints of baby’s breath. The petite bridal squad bouquets were arranged using all white florals such as calla lillies, roses, brovardia. The bride’s bouquet was finished off with a wrap in ivory ribbon, while the bridesmaids bouquets were wrapped in a teal ribbon. The boutonnieres were made with white fressia and ruscus. At the entrance of the ceremony, you immediately see two large flower arrangements sitting on classic ivory pedestals. The pews were decorated with a mix of small half pomanders using white florals and greenery, and floating candles. To liven up the fireplace altar, we placed two flower arrangements asymmectrical to each other. These pieces were soft, whimsical, and had a lot of movement in the greenery. Lastly, the reception centerpieces were small low lush pieces arranged using all white blooms, with greenery dripping out of the gold dish. 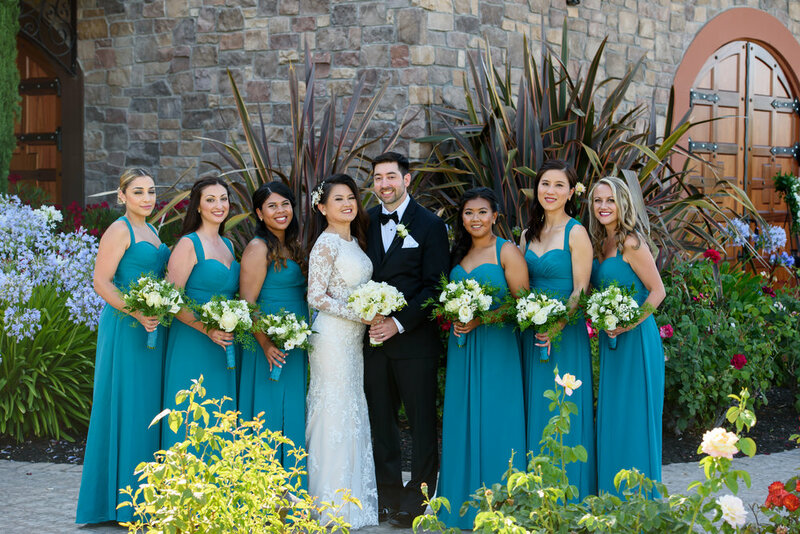 A beautiful summer wedding held at Casa Real Winery in Pleasanton, California. Our bride envisioned a rustic chic wedding while still keeping a romantic feel. For the bridal bouquet, we arranged a crescent shaped bouquet with garden roses, blushing bride, and tea roses, with lots of seeded eucalyptus, finished off with a wrap in white satin and chiffon ribbon. For the bridesmaid bouquets, we arranged a smaller version of the bride’s bouquet, but without blushing bride, wrapped in blush satin and chiffon ribbon. The flower girls were given handmade princess crowns as well as their own nosegays, using the same bridal blooms. The aisle was decorated with white rose petals. The table centerpieces for the reception were large round arrangements filled with roses and dahlias. Lastly, the wedding cake was topped off with beautiful white roses.